Blanche DuBois once said something about relying on "the kindness of strangers." In this Web Wandering Wednesday, so have I. Someone else was doing the wandering and ran into a post I'd written where I talked about my collection of women wearing glasses and the book I'm writing (working title: My Blind Passion). That wanderer would be Sheri Bush of TwigTalk and Family Twigs. Sheri sent me a wonderful email in which she wrote about a photograph that had been found by her brother in the attic of a house built around 1875. Her brother, who bought the house, was eventually going to throw all the stuff away. Sheri rescued the photograph of a little girl wearing glasses from the trash and named her "Annie" as in Little Orphan Annie. She scanned everything worth while to put on GenWebs for Jackson Co. IN and looked for researchers on the forums/lists in the hope that the photos would be helpful to someone. This little girl is an unknown, and I have found that they seldom are ever named. I have a page of unknown family photos on my personal site. They have been up for a long time and still are unknowns.
. . . I remembered this girl because of her sweet face. She is yours! Now she will not disappear. Thank you for that. My brother will be happy too, as he thought she was "just junk." This is Annie, a gift thanks to the kindness of a stranger who is now a friend. Sheri, I can't thank you enough! 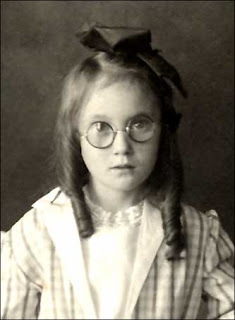 Old photographs of women in glasses are difficult to find, but little girls wearing glasses are even more difficult. Annie is a treasure. I have only scanned her face for you, the whole photograph once researched will be a part of My Blind Passion. Annie, Sheri and I must have some surprises. 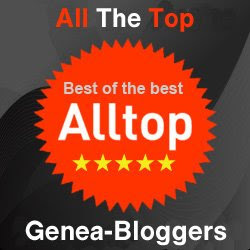 It's true, GeneaBloggers are the best. So when you're out wandering the web visit Sheri's blog and website. Take a look at the page of Mystery Photos and see if you recognize anyone. Pay it forward! Annie. Photograph (Inset). Unknown. Privately held by the footnoteMaven, [ADDRESS FOR PRIVATE USE,] Preston, Washington. 2007. She is such a sweet looking little girl. Thank you for the mention. I am happy she has a home! What a darling little girl - not junk at all, but a treasure! June 20 - And The Guest Author Is . . .